The following are the basics in how I manage my dogs' teeth so they stay clean and plaque-free. In the dialog I have added some definitions/explanations as a help to the novice. I rarely look at alignment of lower and upper jaws until the pups are weaned, between four and five weeks of age. At this time, I begin getting the pup used to having his mouth looked at as the puppy teeth are erupting. With a finger (clean, of course) rub around the gums and new teeth gently. I strive for scissors bites where the top teeth overlap the bottom teeth, and operate like scissors. Overshot bites are where the upper teeth are much over the lower teeth (and jaw). These bites may correct themselves. Undershot bites are the reverse where the lower teeth are much over the upper (in some breeds this is acceptable, but not in ours). Although there may be some future changes in bites, this age is good to begin checking the mouth and teeth alignment as well as routine grooming. It's not easy to look at teeth on a squirming puppy, so you will have to find a position that is comfortable to you and for the pup. You may want to try putting him on his back in your lap cradling his head with one arm behind and keeping the head elevated while you use the other hand to examine the mouth. Another way is to get down on the floor and put the pup between your legs with his back to your chest. Or use the grooming table and have him face you. (I do the latter to start.) From rubbing your finger on his teeth, you can easily change to a finger brush at about eight weeks of age. Later you can use a small child's brush but be sure it is soft. I like to put a drop or two of Nolvadent on the brush as it helps kill the bacteria the cause plaque--I have not had any pup mind this. You can get Nolvadent from several wholesale pet supply companies. The routine of brushing at least twice a week is easily tolerated and in fact some of my older dogs find it so humdrum, they fall asleep while having their teeth brushed! Do not use "people" toothpaste because if the dog should swallow any, it could cause damage internally. By four to seven months the permanent incisors are usually in and the canines are coming in. If an adult tooth is one-third to one-half in and the puppy tooth is not loose, you may need to have your vet pull the puppy tooth. At this stage, pulling will not damage the bud of the adult tooth as long as it is in and down this far. Because of all the activity going on inside his mouth, the pup may not be so willing to have his teeth brushed, but try to keep at it. Regular brushing can prevent gum disease. If you only have a couple dogs, you may be able to brush on a daily basis. Isolate each tooth and when you brush, massage the gum as well. Brush inside and outside moving in a circular motion. The correct number of teeth is six upper and lower incisors, canines are on each side of these (total of four), followed by three premolars on each side of the canines (total of twelve) and eventually the molars, usually two or three on the sides of the premolars. (Note that puppy teeth do not have molars, but they do have premolars.) 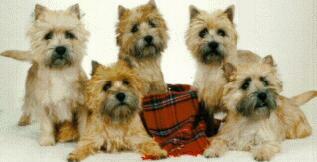 I have not seen a Cairn with four premolars, but larger breeds do have four. To help prevent plaque, I feed a good quality kibble. They love raw veggies, especially baby carrots (I get the kind already peeled and ready-to-eat). I don't feet canned food. They play with gumabones or booda bones (rope toys), but not rawhide. They do get biscuits for treats and before bed. Hills Science Diet puts out "td" biscuits for tartar disease. One daily is enough (do not use as a meal substitute). If I see tartar buildup on any tooth I use a double-ended scaler and scrape it off. You can then polish with a prophylactic paste (available through your vet) or use can use a tooth paste/cleaner with enzymes (also through the vet). If you let the Nolvadent stay on for ten minutes before scaling, the plaque should flake right off. Plaque left on the teeth can lead to periodontal disease and eventually the bacteria can get into the bloodstream, which can go into major organs, lungs, heart, etc., and can even cause early death. If for any reason your dog needs surgery, x-rays, and requires an anesthetic, ask your vet if he will clean his teeth while he is already under. Professional cleaning annually is a good thing. Have teeth checked when you go in for your rabies and other vaccines. If a tooth becomes broken and has rough edges, your vet can grind and polish so it doesn't hurt the inside of the mouth. Older dogs are more subject to this breakage as well as yellowing of teeth. To whiten you can use a cotton swab dipped in 3% hydrogen peroxide and rub it on the teeth.